Buy the Book: Amazon FREE! Macey McHenry—Glamorous society girl or spy-in-training? Synopsis and cover taken from Goodreads. 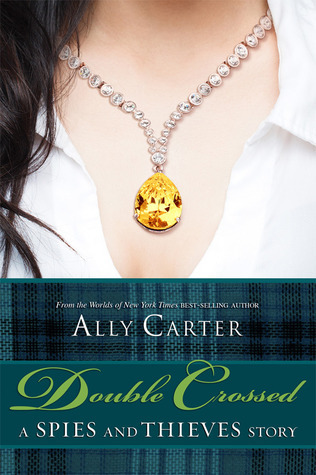 Teenage spies, con-artists and a hostage situation, Double Crossed is anything if not a fun and quick read for fans of the Gallagher Girls Series and or Heist Society by Ally Carter. Personally, I haven't read the Gallagher Girl Series so when I started reading the novella, I was a little worried that I wouldn't get the story and that it would contain spoilers in case I ever read the series. But as expected Ally Carter managed to weave the story so that even those who are unfamiliar with both series' can enjoy the novella. Despite it short length, I felt it was a fun read. I loved the setting of the story, there is nothing better than a hostage situation to add some spice to a spy/thief novella. W.W. Hale was as perfect as ever. I really enjoyed his interactions with Macey and Kat, as they never failed to crack me up. Katarina Bishop was also brilliant and entertaining for the amount of pages that she appeared in the story. As for Macey, I really enjoyed reading about her 'school'. Overall, Double Crossed is a great quick read for those looking for one. It fun fresh and puts you in the mood for some spy/thief action.